I’m a Polack, but thankfully my great grandfather came to America to pursue his dream. Some say it was to put a screen door on a submarine. Others say he wanted to fly to the sun at night. Whatever it was, my family was here, so my grandfather and his four brothers all fought the Nazis as Americans, and based upon the sweet war trophies they brought home, I don’t think they took a lot of prisoners. Aside from the helmets, the SS coat was my favorite, and I dare anyone to put one on and not feel a rush of excitement and/or a desire to wipe out an inferior race. Plus, the damn thing just looks sharp. 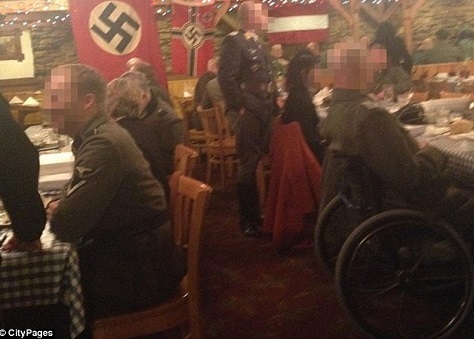 And apparently, a group of guests at the German-themed Gasthof Zur Gemütlichkeit restaurant in Minneapolis agreed with me because according to pictures leaked to a local paper, they held a dinner party for “historical re-enactors” last December where many of them dressed up in authentic WWII Nazi garb. Predictably, whiny liberals have called for a protest and now want to shut the place down, but they shouldn’t knock it until they’ve tried it. Dressing up as the bad guy is fun. When it gets hot, I can’t wait to wear my white Colonel Sanders suit and sit on my porch drinking a mint julep while pretending I own a cotton plantation. To give it an air of reality, I might even pay some Mexicans to do yard work so I can pretend they’re my illegitimate mulatto children.